On Saturday, I did something I've been wanting to do for YEARS: bike across the Golden Gate Bridge to Sausalito. 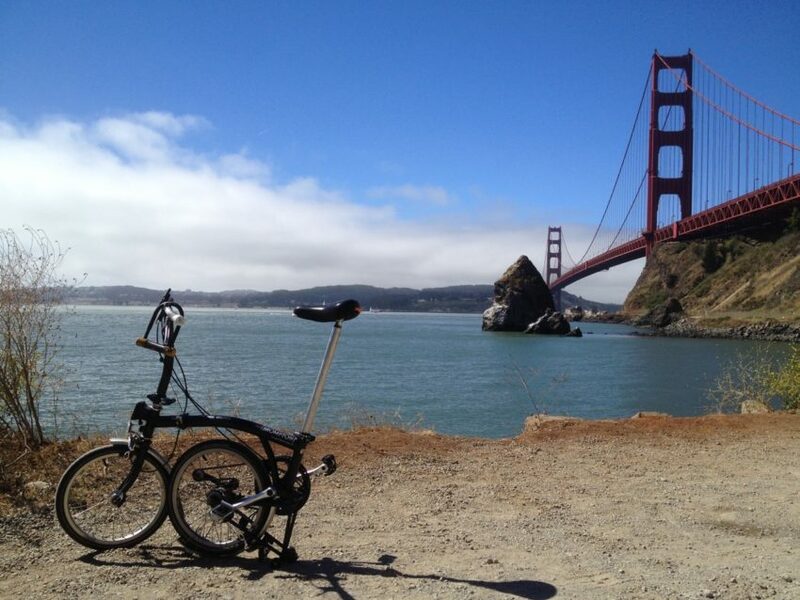 My main hesitation has been that I ride a Brompton folding bike. While the Brompton is an engineering marvel, it's not so good on steep inclines. So getting from my Inner Sunset to the Golden Gate Bridge, and then riding the long, windy ride down to Sausalito seemed like a very daunting trek. I'm happy to report that I was wrong. The Presidio park is really gorgeous and a San Francisco treasure. It's also super hilly and a pain to bike through. So my main challenging was plotting a route around the Presidio. Here's the route I followed. This route avoids steep inclines and is mostly on bike paths. Steiner is really a breeze most of the way, although a bit scary on some of the hills flying down them. Make sure your brakes are in good working order! Also, that "48 minute" figure seems like an overestimate to me. I give it 35 minutes, tops. 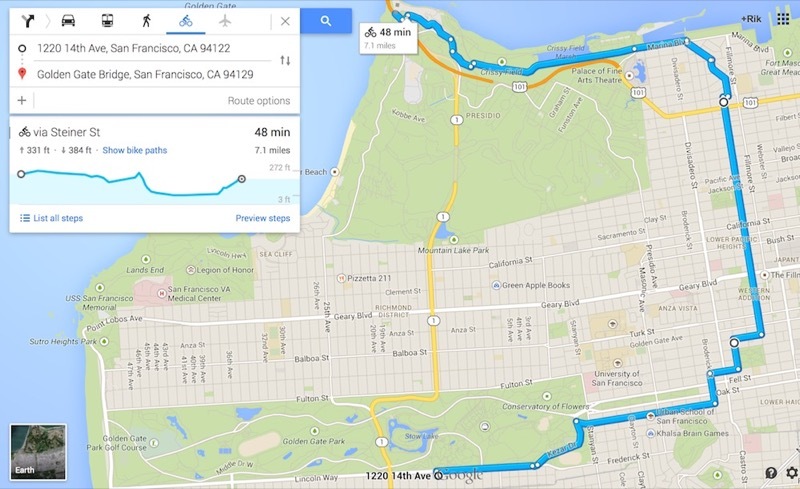 If anyone has a better, easier route through the Presidio from South to North, I'd love to try it. Getting to the Bridge is easy peasy once you get to the Marina. Just ride along the water with all of the beautiful people and enjoy the view. That last little leg before you get to the entry to the bridge does have a pretty steep hill to climb. I saw lots of tourists just sitting on their rent-a-bikes debating with each other whether they wanted to make the climb or not. It gave me a little surge of satisfaction as I blew past them on my little Brompton. One woman walking her bike up the hill saw me pass her and said to her companions, "Am I just a wimp?" The ride across the bridge is FANTASTIC. You ride on the western side of the bridge — the eastern side is intended for pedestrians. I did see some bikers on the eastern sidewalk, but it seemed like a really annoying way to cross the bridge, trying to avoid all of the strollers and large groups of people taking pictures. It was fortunately sunny and not windy when I was on the bridge. But fog and wind at any time of the day are common on the bridge, so YMMV. Lots of boats were out on the Bay on this beautiful Saturday. Yet another awesome way to experience the Bay if you can swing it. Last year, I rode on the "Call of the Sea" boat with some of our science teens, which was the best thing ever. The ride from the Bridge on the Marin side to Sausalito could not be nicer. Basically follow these instructions. They direct you to the parking area right across the bridge on the Western side, toward a pathway for pedestrians and bikers, under the bridge, and toward a road that runs right along the water. There's one slight hill for a quarter mile or so, and then the rest is downhill the whole way. In no time at all, you are in downtown Sausalito. The whole thing door-to-door took me about an hour and a half. And that was without trying that hard. I'm sure a reasonably fit person on a "real" bike could do it much faster, if they wanted to. But of course, the point is the journey not the destination. I savored my victory bran muffin and macchiatto at Cibo Bakery in Sausalito, basking in the gorgous sunshine. Then I headed toward the ferry to take me back to the city I love.